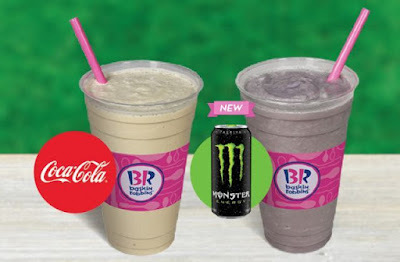 Baskin-Robbins welcomes August with the new Energy Freeze as well as new Caramel Cream Puff ice cream. The new dessert features a blend of Monster Energy or NOS Energy drink and Wild 'n Reckless Sherbet and is available through the end of the month. Freezes are basically blended floats and can be customized with any bottled or canned drink plus ice cream. On Sunday, August 5, from 3 to 7 PM, participating locations will be offering free samples of the new Energy Freeze as well as the Sprite and Rainbow Sherbet Freeze and Coke and Vanilla Ice Cream Freeze. Caramel Cream Puff is the chain's August Flavor of the Month and features a swirled mix of pastry cream-flavored mousse ice cream and salted caramel ice cream with burnt sugar crystals, pastry pieces, and a burnt caramel swirl. Additionally, on Friday, August 31, 2018, participating locations will be selling regular scoops for $1.50.